This ranch-style duplex and the identical “mirror image” duplex constructed at 2668 Michigan Avenue were both constructed in 1957. The owner, Derick S. Hartshorn, had purchased two adjacent lots, Lots 21 and 23 of Block 2 in Evans’ Addition. But instead of building one house on each lot, he decided to split both lots down the middle and constructed this home on the southerly half of Lots 21 and 23 and the Michigan home on the northerly half. These two lots, like all the lots in Dean Park on the southerly side of Michigan Avenue, are part of Evans Addition, one of the earliest Fort Myers subdivisions. Major James Evans developed Evans Addition from a 275-acre land grant parcel he purchased in 1880 from the federal government. Each of the 366 lots in Evans Addition was 50 feet wide and 150 feet deed, as shown on a map recorded in 1905 with the Lee County Clerk. In 1913, The Carl F. Roberts Company, a prominent Fort Myers developer, purchased 46 of the lots in Evans Addition for a total purchase price of $6,000. In 1925, The Carl F. Roberts Company sold this property to C.R. Wade of Fort Myers. 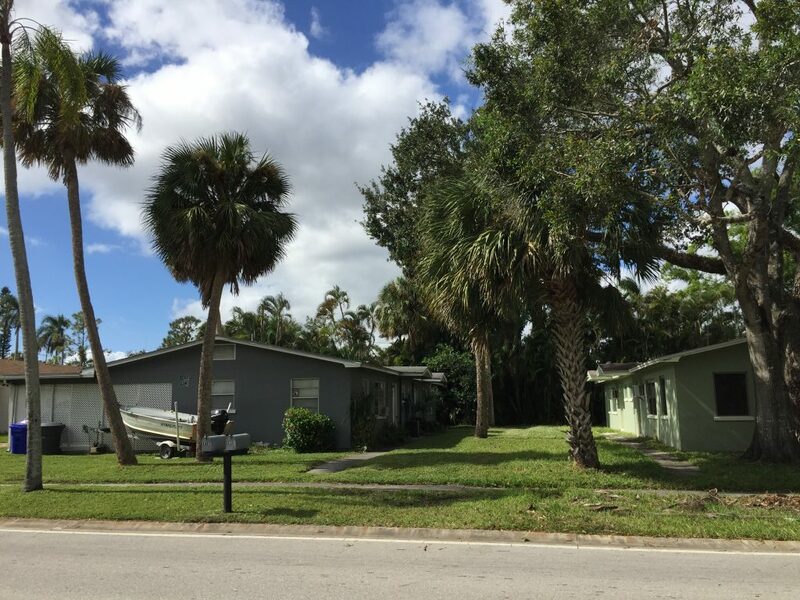 It had many subsequent owners, but remained vacant until this duplex was constructed in 1957. On November 25, 1956, Mr. Hartshorn was granted a $17,000 building permit for the duplex at 2668 Michigan Avenue, and on December 16, 1956, he was granted another $17,000 building permit for this duplex. Derick S. Hartshorn was a mechanical engineer, born in 1883 in Worchester, MA. He and his wife, Mary, married in 1909 in Boston. The couple had three children and Mr. Hartshorn’s career took the family to New Jersey, North Carolina, Maine, Massachusetts and New York. Mrs. Hartshorn was a church organist for many years in Springfield, Massachusetts. In 1950, the Hartshorns decided to move to Fort Myers, while still maintaining a winter home in Johnsonville, New York. Mr. Hartshorn began a second career as a real estate developer and undertook a series of residential construction projects. After Mrs. Hartshorn’s death in December 1966 at age 82, Mr. Hartshorn remarried in July 1967 and died the following September at age 84. Evans’ Addition, Block 2, southerly half of Lots 21 and 23.